What is Factory Reset Protection (FRP)? FRP is a protection and safety feature to prevent people from using a stolen or lost device even if they try to hard reset the phone to factory settings. FRP works only when you’re signed into your Google account and then if someone tries to hard reset your phone through recovery mode, they are required to enter the Google account details, i.e. email and password from the last registered Google Account on that device to regain access. This means the person won’t be able to use the device freely unless he enters the correct credentials. 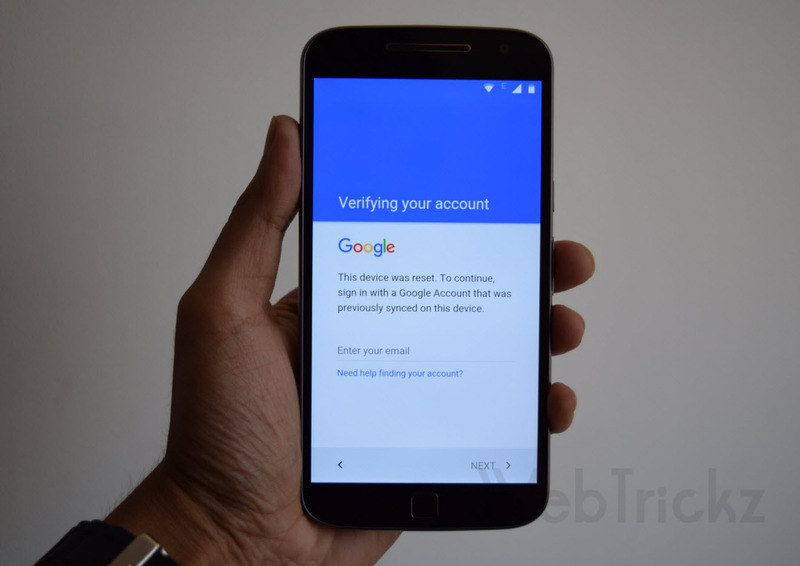 Perhaps, if you’re a Motorola Moto G4 Plus user and somehow have forgotten your Google account email or password and hence are stuck at Google account verification because of FRP lock then we’ve got you covered! After trying for couple of hours and taking some references from RootJunky’s Droid Turbo 2 FRP video, we were finally able to find a workaround to bypass factory reset protection on Moto G4 Plus (2016). The device was running Android 6.0.1 Marshmallow with May 1 Security patch level. The process involves a series of complicated steps which are rather easy if one follows them step-by-step as stated. You also need to download some apps on phone during the process but the job gets done without using a computer. This bypass trick should work on the Moto G4 and some other phones as well. We have made a video tutorial for your convenience, just make sure to simultaneously perform each step on your device to get over FRP on your Moto G4 Plus (XT1643). The above trick is indeed useful but worrisome at the same time as it could potentially allow a thief to gain unauthorized access to your smartphone by following the stated steps. i am new to your blog and found it very informative…. Does it work in Moto X? it is not working on my phone… Its simple but i do not get the option of share after adding a network. Could you please help me…? How to recover the gmail account of MOTO G4 + Mobile when phone is formatting or screen disappearing. Sorry doesn\’t get share option please reply….. First… Moto xt-1642 ok….